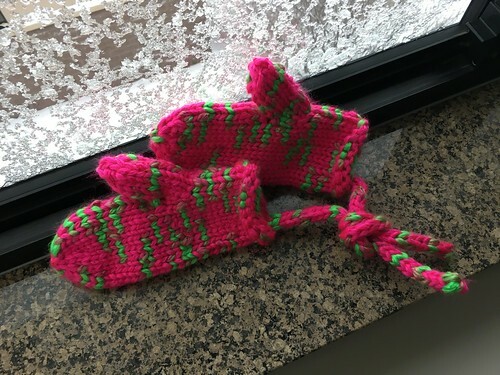 I had this idea to knit a bunch of pairs of Twinkle Mittens as White Elephant Christmas gifts after knitting an entire mitten within one shift at NU (while still helping customers, ringing up sales, and other miscellaneous tasks) — bulky yarn makes for quick knits! I also decided to try out different needle sizes just to see what would happen with the finished gauges. 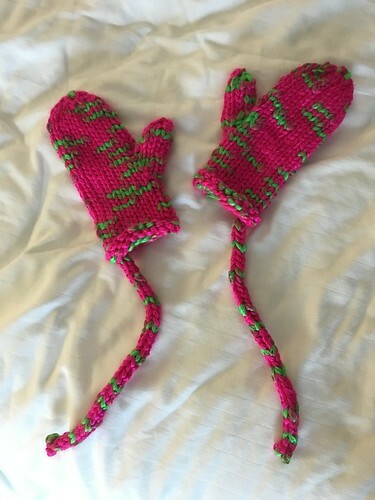 My family’s Christmas was happening first so I whipped out a pair with Katia Extreme pretty quickly (and opted to use the leftovers to create a couple I-cords to tie the mittens together when not in use)… then I found out we wouldn’t be doing a gift exchange, so Hannie got this first pair. 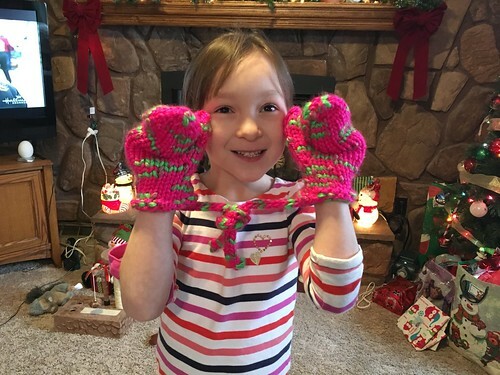 They actually turned out to be the smallest so it worked out okay & she still loves anything that’s pink. 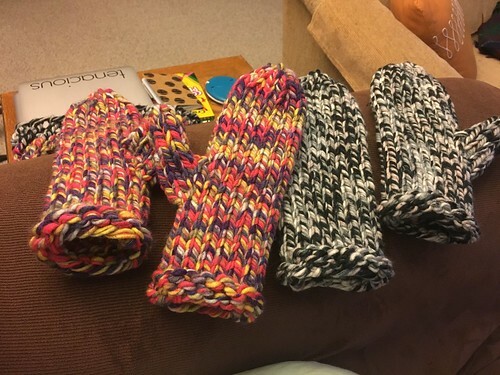 I knit the other two pairs for Jason’s family Christmas. 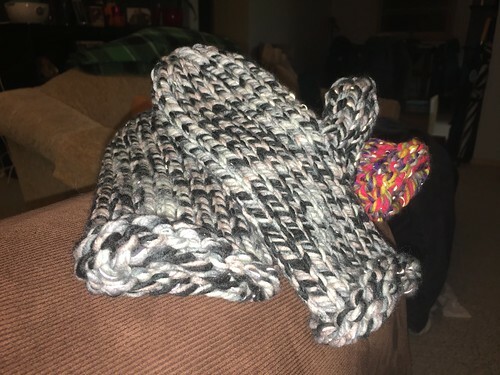 The yarn actually has a reflective thread woven in, so I thought it’d be more fitting; they live out of town so it gets pretty dark — if someone is driving towards them, the mittens will keep them safe! Right? The blank & white pair ended up being the largest and they still had a pretty thick, warm fabric so I think I’d stick with US13 if I repeat this pattern in the future (likely; it’s so quick!). 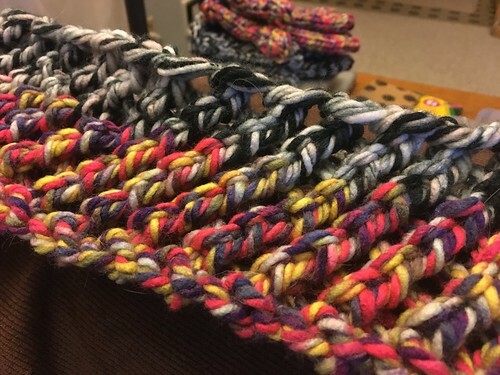 Since I had some leftovers of these two yarns, I opted to make a colorblock-y cowl to go with the mittens. 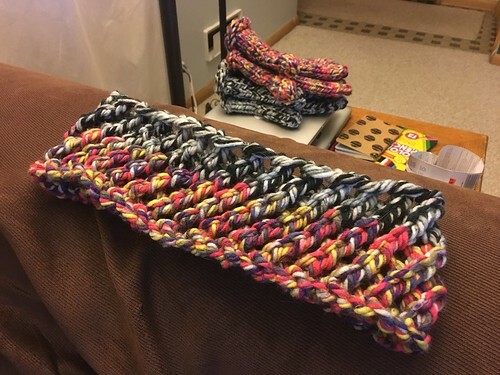 I think the tedious (but polished) sewn bind off took longer than the actual knitting. 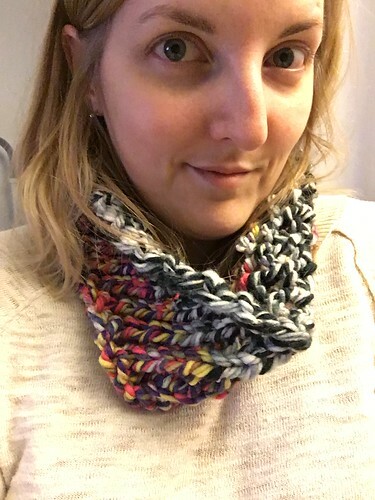 I’ve done cable/knit bind off on other cowls and they’ve been overly tight; I wanted a stretchier finish to match the flexibility of long-tail cast on.